This is a festival created by animators, for animators, and all lovers of animation. We've thrown the door wide open for submissions. You may submit films made at any time during your life. And you are free to simultaneously show your work online or at other festivals. All types of animation are encouraged: hand-drawn, computer-generated, stop-motion... We attempt to program shorts blocks focusing on each method separately—both to educate, and to satisfy each methods' enthusiasts. We strive to pack the weekend with as much animation as possible. But the festival is still bigger than just this. 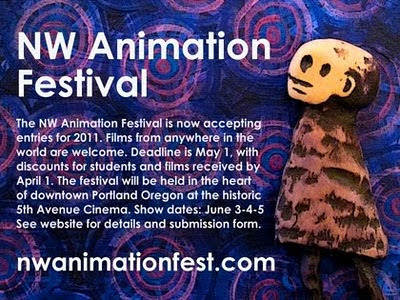 Select films go on to become part of our "Best of the NW Animation Fest" traveling show, which will tour the region during the following year.